Magazines in print are suffering so one would think People and others would do their best to ensure their digital stream worked and was consistent. NOT SO! This app is constantly plagued by issues. The latest one? It will not take your credentials! You type them in and nothing occurs so you cannot download the latest issue. Tried killing app, rebooting iPad, reinstalling app. NOTHING. Please fix. So if there's any sort of problem w/ your account, you get locked out of digital subscription. But the app doesn't tell you it could be a problem w something on the account. So you have to call customer service 1-800-274-6800 and then they transfer you to a digital service assistant. I finally got ahold of someone by phone who fixed the problem but oye I feel like there should be a pop up message that says "problem w account, call customer service". Could have saved me a few hours of trouble shooting and delete/redownloads. Just saying. Please remove the last update! I’ve used this app for a long time, and for the most part it’s pretty good. However, ever since the last update in June the issues tab keeps showing spinning circles instead of the issues .... for issues already downloaded! And if I’m not on WiFi the spinning circles prevent me from reading the issues I’ve already downloaded. Please fix. Also please get rid of the message which appears at the top of every page telling me to swipe up. It’s so annoying! It blocks what I’m trying to read. This app is maddening. I have to email customer service every 6-8 weeks because the app “locks” me out and I am unable to download issues. It also locks me out of past issues so I can’t read ANY People magazines that’s I’ve already downloaded. Several times I’ve had to delete the app and then go to the Apple store to download it again. This is supposed to “fix” the problem. However, it hasn’t. I just went to download the latest people magazine, only to find out that I am locked out of every issue that I’ve downloaded. Customer service is not helpful either. I am a long time People subscriber. My subscription recently expired and I let it....because of the digital experience. I don’t even read the print. I only use the digital. And as the app has updated of late...it just gets worse! Where it used to bookmark where you left off...now it does not. Where it used to be smart and you could simply touch a picture and be taken to the article...now it does not. Pathetic. I called customer service and that was futile. People needs to recognize the importance of their digital platform and get it together. New update stinks. Every time i touch the screen a message saying “swipe up for reader view”appears. It no longer remembers the last page I had open. I’m not renewing. So disappointed. The update needs an update! I don’t really have any issues with the app, but is is really annoying that on EVERY page a notice pops up to “swipe up for reading view. One notice is enough. It does not need to be on every page. Why is the a lock on my issue on my iPad, when Apple is indicating I’ve paid for a subscription? And it isn’t locked on my iPhone. And I received notification the the new issue is available. Clearly, your app has major problems. And the rating indicates it has been going on for a while. When are you going to address? People passes the buck to Apple on this, but it sheds negative light on both. At least let us bookmark where we left off!! This is a terrible app now!! I keep waiting for an update. The app used to be OK not great. Now this app is totally horrible. There are too many things wrong with it even begin listing. I have had a digital subscription for years and the app has been OK until this latest update/re-vamp. Difficult to read pages. Most frustrating is no way you can bookmark your page when leaving the app. Every couple weeks, I have to delete and re-install so it will recognize my account and let me download the latest issue. DO NOT WASTE YOUR TIME! I couldn’t wait to read my new People on the digital app because it looked so crisp. Then they shrunk it all down and I had to zoom in to read everything. And now, with this new called ‘upgrade’, it’s the worst ever. Have to log in every week, pictures look blurred and crappy unless you read in ‘swipe up mode’, never saves your place if you leave the app. Zero stars! I have nothing but trouble accessing my digital People Subscription every week since the update! It’s horrible. Before it was a breeze to access and read, now I’m constantly having to contact support. They should have just left it alone. I’m cancelling my subscription, it drives me crazy! My app kept saying “access denied” so I deleted and reloaded it.....welp didn’t fix a thing. Now it won’t even open at all. What’s the point of paying for he digital subscription when I can’t even use it? If I could give it 0 stars I would. This really is the worst app! The “swipe for reader view” covers up the top of the page and I can’t get rid of it. That’s when I can actually get access to the current issues! Since the update I don’t have access! They charged me for 6 months, but I can’t even get the issues! I tried to sign in, but it says it’s the wrong password. When I click “forgot password”, they say they’re going to email me “in a few minutes” with instructions to reset. However, I never receive the email! I just cancelled my subscription. I’m done with them! I buy individual issues. Every time I buy ONE the screen goes white and I get NOTHING! USUALLY I delete and reinstall the app. Now I can’t even get my issue I paid for that way. Why should I have to contact app support to get something I paid for already! Fix your app!!!! I bought a special digital issue two years ago that cost $16. When people did their last update, there was no special issue section so I called People who said I needed to talk with People's digital department, who said I needed to talk to Apple because I paid for it through iTunes, who said I needed to talk to the app developer, who said I needed to talk to People's single edition dept and they would send me that special edition in paper format, who then told me no, they want $16 more dollars. This has been going on for 4 months with no results. Not to mention the fact that there is no bookmark anymore and they ask an outrageous amount of money for a digital subscription. I told them to cancel my subscription when it is up. Have decided to cancel my subscription. Extremely difficult to access the pages and many times I’ve been unable to download the issue. Not worth it. Before I cancel my subscription, will there be bookmarks in th near future or not? Thanks. Leaving emotions aside, can you please tell us what those new features are? Thank you. What exactly are these new features? When do we get bookmarks????? Great news about the forthcoming update. How near is the near future? Thanks This is a magazine app, not a social media one! I don't have the time to always finish an issue in one sitting. There are no bookmarks! I can't even delete issues offline. Don't piss off longtime readers any further and remember you're providing reading material. Bring on the next update with at least bookmarks!!! Please consider if you’re going to become a subscriber. I have been one since 2001, and “print and digital” since 2014. Imagine my surprise when I renewed last October only to find when my new subscription started it was for print only. Where was that on my renewal form? Oh, it wasn’t. It was just a RENEWAL FORM. And since I had been doing the same thing for 4 years... why would I quit? But when I contacted Customer Service and then Account Services...I was told “we’re so very sorry but our system won’t allow us to add the digital option to your account, not at that price”. WHAT? It was over $200 so it’s not like it was a buck! And where was that noted on the renewal form, that there were different prices for print vs. print and digital? But for an additional fee, they would be HAPPY to add it on. I said, “no thanks”, and will be deciding with my husband if we just want to cancel outright or let the subscription run out and not renew. Either way, this money-grubbing magazine won’t get another dime out of me. If this is how a customer of over 17 years is treated well...this is obviously not the magazine for me. And the app leaves a lot to be desired, by the way. A LOT. I agree with all the negative comments on latest app update. I have subscribed for at least 3 years to both digital and hard copy. With this update I have had problems every month. The last 2 months I have been unable to "unlock" the new issue. Needs to be fixed now. Updated (2018) review: Does developer read these reviews? No one seems to be happy with the current version, me included. There have been no updates to fix the problems I previously reported and that I also sent by email which I never received a response. What is the point of offering a digital version if it is going to be so user-unfriendly!?! Updated (2017) review: Why mess with something that works. How things have changed since I posted the previous review below. I HATE this latest update. When I get out of an edition and return later sometimes it is where I left off but more often it is the download page. I select, get the cover page and then have to find where I left off. You took away the bookmark feature and the thumbnails are so small I can’t find an image that looks like the page on was on when I got kicked out. Getting the message to swipe up for reader view is annoying. No way to turn it off. On 11/12/17 I sent an email with the complaint about not being able to turn off reader view and was told it was being referred to the appropriate office. No further response. Later I received a customer service survey. No one contacted about my complaints. Please listen and respond to your customers. 1st review: I have been a People subscriber almost since the first edition and love the digital version. I have my magazine with me everywhere I take my iPad. I really like the bonus pictures and stories, and being able to watch the videos that I don't get in my paper magazine. Great app! I have no complaints. Why mess with something that works. How things have changed since I posted the previous review below. I HATE this latest update. When I get out of an edition and return later sometimes it is where I left off but more often it is the download page. I select, get the cover page and then have to find where I left off. You took away the bookmark feature and the thumbnails are so small I can’t find an image that looks like the page on was on when I got kicked out. Getting the message to swipe up for reader view is annoying. No way to turn it off. On 11/12/17 I sent an email with the complaint about not being able to turn off reader view and was told it was being referred to the appropriate office. No further response. Later I received a customer service survey. No one contacted about my complaints. Please listen and respond to your customers. Previous review: I have been a People subscriber almost since the first edition and love the digital version. I have my magazine with me everywhere I take my iPad. I really like the bonus pictures and stories, and being able to watch the videos that I don't get in my paper magazine. Great app! I have no complaints. I hate the new format. It does not save your place in the magazine if you leave the app and come back- I’m just going to read it on texture from now on and won’t renew. It’s a waste of my time in the new format. Very disappointing. Awful awful awful. Worst upgrade to an app ever. (Sarcasm starts here) Thank you people as I love having to find the last page I was reading and the last issue I was reading every single time I launch the app. My days may be filled with a full time job and caring for my family and home but it just wasn’t fulfilled without a online news magazine (that is suppose to be a relaxing indulgence) creating more frustration for me. I’ve been a subscriber for years, but every time there’s a new issue, it tells me to subscribe. So frustrating! The People app was one of my favorites but the latest updates have left us with a useless app. I’ll go back to reading the paper magazine. One of the most annoying changes is that the app can’t remember what page I’m on anymore. Since I don’t sit down to read the entire magazine in one sitting, this is quite irritating. In previous versions this feature worked great, let’s bring back the older version! This is the worst app I’ve ever used! Every week I try to download the current issue and even after many attempts it fails to download - usually for several days. I now realize that by the time I finally get the issue to download, the good stories have already been all over the Internet and I’ve read them. So the magazine is old news. The very reason print news is dead. I will not be renewing after 25 years. Picture quality is horrible. I only updated because I couldn't download my subscription and wish I hadn't. Loved the old app. Now the colors are waaaay off and pictures distorted. Bring the old one back --- this looks like 2007 not 2017!!!! App was updated a couple of months ago. Now it is terrible! You used to be able to go straight to your downloaded issues. And now you can’t. You have to keep bringing up all the issues over and over again to find the ones you downloaded. App also constantly forgets where you left off in reading. And it shuts down all the time, making you search yet again for downloaded copies. Absolutely awful! No bookmark to return to previous page, blurry photos and laborious “reader view” make this digital version of a good magazine unreadable. The former format was much better. Please bring back the previous version! How could an update be so inferior to the previous version?Every update gets progressively worse. I used to love the app. Now it is just horrible. If it was possible, I would rate with zero stars. The sad thing is, the last version was so much better. People ruined the enjoyment of reading online with this update. I truly hope they correct this soon. The People updated app is terrible. It no longer takes you to the page where you left off reading. It takes you back to the beginning, forcing you to swipe through the entire magazine. To make matters worse, the “swipe” function doesn’t work well, sometimes not at all. Trying to read the magazine is an exercise in frustration. Please fix it! Now, another update and it’s even worse! No way to bookmark your page, and the ‘reader view’ comes up every time you move to the next page. C’mon - are the developers even paying attention to the customers? I think not! Like the other review, I can't believe that they just shrunk the page for the tablet. The printing is too small. Other than having the convenience to read the magazine on my tablet, the electronic version offers no extras and in fact is a step back from the printed version because it's smaller. The version before this was fine - why did you change it????? Great news about the forthcoming update. How near is the near future? Thanks This is a magazine app, not a social media one! I don't have the time to always finish an issue in one sitting. There are no bookmarks! I can't even delete issues offline. Don't piss off longtime readers any further and remember you're providing reading material. Bring on the next update with at least bookmarks!!! Seriously? You still have not fixed this app or other Time Warner apps. This app is horrible. I am seriously about to get rid of all Time Warner subscriptions. Awful. Minor improvements seem worthless given all of the glitches this app now brings with it! Every week I need to delete the app and reload it before I can download the issue—otherwise the app doesn’t remember me and will only offer a 15-page preview. And I’m not usually one to read the whole magazine in one sitting, but if I go away from it and then reopen it later I have to start at the beginning and scroll across the bottom to find where I left off. The only positive upgrade is being able to turn my iPad to landscape and see both pages side-by-side—no longer cutting photos and headlines in half. The older version of the app was so much better than this one. The Developers there sure didn't test this enough or try to preserve the features that were the biggest satisfiers. No bookmarks, slow to load, and when I click to open the issue it opens to the cover story halfway thru the magazine. Nothing is intuitive anymore. That swipe up for reader view message is so irritating and unnecessary. Once you prefer the reader view, it should keep that setting throughout. Was the update written by new grads who have never used a magazine app before?? Update: Now I can swipe to get a readable version but if I don't read the entire magazine before clicking out to check my email or any number of things, it goes back to the cover and I have to remember what page I was on. The interactive version you had originally was 100 times better than any update since. Please fix this! I thought my vision was getting until I realized People changed the format. I can no longer read the magazine on my iPad without enlarging every piece of text. This used to be my favorite way to read People. Now it's frustrating to no end. I might as well delete the app and just read the print version. People got it wrong with this update. Takes ages to access subscriptions after downloading. No bookmark. "Reader view"? Can't figure that out. All I get is bumped out to the main site if I swipe up. Considering cancelling my digital subscription. I’ll be cancelling my subscription ASAP because of this new app. Wish I could give zero stars. This upgrade is awful. I have been using the digital version of People magazine since it came out(and it was free with a print subscription!). I still can’t figure out why they went backwards and took the video and audio links away. I really enjoyed hearing song samples from new albums and trailers for new movies. Now I can’t even open it anymore. I’m trying to download it again and it’s just spinning. If they wouldn’t have added website feed, it would still work. Why am I paying extra for this? It used to be my favorite de-stressor. Now it brings me stress. This app is horrible. Magazine subscribers are supposed to have access to the digital version. When you try to log in it tells you that they can't process the request. Not what it used to be, making it very hard to want to stay a subscriber! Does not work with IOS 10. Used to work fine with my 2nd gen iPad. Has not worked since I moved to iPad Air about a year and a half ago. Why was the app retired? I'm a long time magazine subscriber and frequently checked out the articles on the app. I can't always and sometimes don't always want to watch videos and I'm extremely disappointed with the new People/EW app! They took it away!! Hell no!! Bye bye!!! What a waste of time going through a never ending circle trying to get the digital version. Makes me regret renewing my paper copy!! It's great for an airplane ride but generally lacking in value tho no less in price .... Let me see how this trial run works. Hey guys, This isn't working in iOS 10, on iPad Air 2. Other newsstand apps are fine. Music interrupts my music or audiobook. Pictures don't load. Doesn't update in a timely manner. Nothing like discreetly reading at work like having blaring advertisement sound start playing. I have been a People Magazine subscriber for many years. While I enjoy their printed publication, their app is one of the worst I've seen. I have contacted their support team numerous times for the same issue: when I log into my account, I am still prompted to pay for each issue (again!) before I can view it in their app. This issue has persisted for years, across numerous upgrades of the app. In short, the app almost never works as it is supposed to, making it completely unusable and worthless. This app has one purpose and consistently fails to perform that one purpose. I'm like many other subscribers, frustrated that I can no longer access my digital issues. I tried uninstalling and reinstalling the app with no luck. At first I couldn't access the current issue. Now I can't access any of them, current or past. I never had any problems until tonight. Very disappointed. The app doesn't work at all anymore. And it should stop asking to purchase subscriptions every 30 seconds. If I could give negative stars I would. Even though I have a digital subscription it keeps saying I have to pay for each issue before downloading. Contacted People customer support which was useless. Told them the problem and they proceeded to tell me how to download! Nothing about the problem I was having. Only way I can download and read is thru the Amazon app. Get it together People Magazine!! The magazine is grossly expensive. Years ago I had a subscription, I was going to renew it when the Jonbenet story breaking and opened the app. $6 per issue?! Wow, no thanks. Needless to say, I did not subscribe. I feel like I'm on a carousel - round and round round - still no access. Online help says it will download to the newsstand app...it did not. App won't even open despite downloading twice on iOS 8.1.1. Canceling digital subscription immediately! How do you take a glossy great app and make it look like a trashy throwaway magazine from the 1970’s? Well ask People. That’s what they have just done. Absolute garbage. Still SOOOOO BAD. Deserves zero stars. I guess they do not pay their developers. This application is so bad, it is rare that I can actually download the issue week to week. I prefer to read People on my iPad but it seems almost impossible. This week's issue is on the newsstand but I am not able download it once again. I am ready to cancel my subscription, especially since Time Inc. basically forces you to buy the print addition in order to get the online addition since it is cheaper that way. What a scam. Not worth the headache. Still SOOOO BAD. I agree with the many reviews about how horrible this version. It is simply hard to navigate and it is NOT stable. I feel stuck using this app since I have a subscription. Hope the developers will actively change this for the better. This new version of the app is awful. I had no problem with previous version. Now I can’t even get my online edition of People. They should go back to previous version. Awful, awful! New update stinks. Every time i touch the screen a message saying “swipe up for reader view”appears. It no longer remembers the last page I had open. I’m no renewing. So disappointed. The update needs an update! I am so frustrated with the new update! I have to sign in each and every time to get the new weekly magazine. It is not user friendly. The paper version is available a day or two before the digital, I can no longer access my downloaded issues when I’m on a plane - the main reason I opted to pay EXTRA for digital access - and there is no bookmark. You’re forced to search for where you left off. Wish I could award ZERO stars. Worthless. I hate the updated app and when my subscription is up, I will cancel. Hate that it does not remember where you left off. Just such a mess now. Simple is sometimes best and does not always need changed. I loved how interactive this People magazine app used to be. Now it’s just like reading the magazine. The print is so small that I am constantly zooming in just to be able to read the article. Horrible “upgrade”. It's hard to fathom what they were trying to do with this update. Reader experience is so much worse, especially the visual quality. In a world where we expect only improvement (UHD, OLED,etc), it's stunning to get a degradation like this. The changes in this app are making me consider canceling my digital subscription. I shouldn't have to spend extra time clicking on the magazine cover numerous times to open it when I've already been reading the magazine. Every time you open the magazine you will have to search for your page. It never opens to where you left off. What happened to extra pictures because you're reading the digital version? That's gone. Each page now is blocked with a message to swipe to read in a different format. But it blocks the top of the page making it impossible to read. Once you go to article the pictures come up so slowly and often blurred. Bring back the previous version. It had flaws but nothing to this extent. What the heck did they do... they took what was one of the best digital magazines and made it crap over the past few years after a few iterations. I came to write a review and saw my original review (shown below) and it reminded me just how far they have fallen. No bookmark when you leave the app, you have to find your place again every time you come back, swipe up for reader view message every time you go to the next page is so annoying. Not interactive, just the print magazine in digital form. I’m not sure how much longer I’ll keep my subscription if they don’t fix things. Previous review: People magazine got it right. The best iPad magazine out there. Able to have subscription and not pay per issue, great interface, love the extras such as additional photos, videos and music clips. The bestest!!! The new app is absolutely horrible. Trying to delete or download an issue is like watching jello gel. The app also just stops working at any given moment. Tonight I tried to download the newest issue and it just goes to a blank screen then back to all the issues and when I try to download...back to a blank screen. I am supposed to renew my People subscription in the middle of December but why would I spend money, and People is NOT cheap, for something I can't access. SO frustrating. I also hate all the other crap on the screen now...I just want to read the magazine! Not only is the app worthless, I can’t figure out how to stop the auto billing. I deleted the app twice but still get billed for something I haven’t looked at in probably a year. Worst "update" I've ever seen! There is nothing about this app that works right...trying to read the magazine is miserable! People should give me my money back for the subscription. This app makes it worthless!! I just deleted my subscription. That is how bad the latest update is. It doesn't remember you logging in. It pushes a "reader view" via a black box on every page. And most importantly, it made all the pictures blurry and out of focus. The magazine is essentially unreadable now on an iPad, and it was fine before. I encourage others to cancel and delete the app too. Updated 11/24/17 - What happened to the bookmark feature?? Blurry pictures, not user-friendly - especially when reading offline, poor all around! But most of all, if I can't read the whole issue in one sitting, (which is never) I'd like to know where I left off! PLEASE ADD BACK BOOKMARK FEATURE Updated 7/7/17 - What's with the new redesign? The text is too small to read without expanding every page! What happened to all the interactive content? That was the fun part of the digital version. I don't want a shrunken down copy of the print magazine that's too small to read. If that's the case, give me back the crossword puzzle that was in the print version that couldn't be in the digital version! The new app format is so awful!!!! It's so slow, doesn't even load sometimes. My place never gets saved when I stop reading an issue and close the app. Sometimes the app shuts offing the middle of using it. TERRIBLE!!!!! I am a long-time People subscriber. I have the iPad with Retina Display, and People magazine always looked crisp and perfect. However, suddenly most pages are completely blurry. Plus, the “solution” to the new minuscule print is a completely annoying “Swipe Up for Reader View”. The entire thing is such a mess! From the blurry photos to the smallest print to very busy pages with constant ‘swipe up’ messages, it’s so unenjoyable. I don’t want to have to swipe up to read a second version! And many photos in the ‘reader view’ don’t show up at all. PLEASE fix this mess before I give up one of my favorite magazines! I can't make this a one star review but that is all it's worth. The new app is clunky, slow and not user friendly at all. If you stop reading in the middle of an issue it takes you back to the beginning. To read bigger is awkward. This app was so good and then it went to pdfs you couldn't make bigger and now this. Stop trying and go back to what worked in the past! The font is way too small. The issue does not stay open to where you left off when you reopen the app. It has in app windows that pop open all the time, which is annoying. Please fix this update or revert to the old version but do it fast please. HATE THE UPDATE!! Canceling subscription! I absolutely HATE this stupid update!!!!!!!!!! The app used to save my page in the issue I was reading and whenever I had a free minute, I’d just click on the app and go straight to that page. Now I have to go through all this other bologna that I don’t want to see before I can get to the issue I’m on and it doesn’t even take me to the right page! I waste my few minute of “alone time” from the kids trying to find my page, so that by the time I find it, my “alone time” is over....If it stays this way, I’m canceling my subscription cuz I only read my digital issue and this is a HORRIBLE waste of time!! This is a magazine app, not a social media one! I don't have the time to always finish an issue in one sitting. There are no bookmarks! I can't even delete issues offline. Don't piss off longtime readers any further and remember you're providing reading material. Bring on the next update with at least bookmarks!!! How can something be released that is an utter failure? I can’t even begin to describe the many ways it does not work. The most annoying, it does not let me see a downloaded issue. I click on the cover and all I get is a white screen. Second, if I do get to the magazine, unbearably slow. Also, slow just to start up. 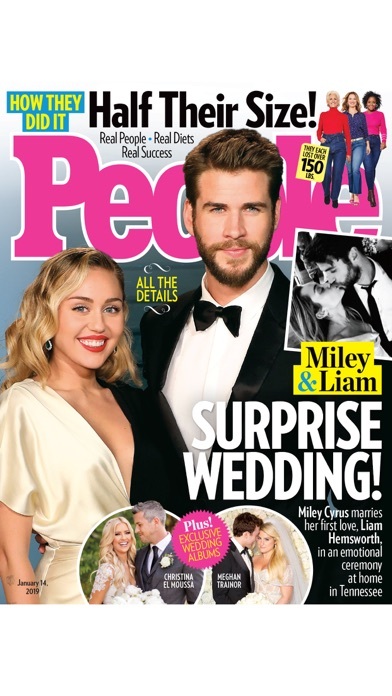 The latest update has pretty much made People Magazine useless. 1. It takes forever for the pages to upload! 2. I have had a subscription that been on auto pay for years. When I tried to download the new issue, after waiting 10-15 minutes for the App to load up the App says I don't have an account. 3. I went back thru my subscription payments and they were renewed in October and their current. SO for no reason People is blocking me from downloading the latest issue even though my subscription is current. TERRIBLE APP AND SERVICE!!! The People application was my favourite to read, however this new update is dreadful. Wants me to purchase each new issue despite having had a subscription for years. No amount of deleting the app or restoring purchases seems to help. Contacted People and was informed that it is an ITunes issue as I have a digital subscription. I seriously don’t need the run-around. Same issue with Entertainment Weekly. Will give it a week or so then will stop wasting $16 a month. Developers smugly say in Help to restore purchases. That only works for past issues. Can't access current issue. How is it even possible to release an update with such a huge bug? My subscription would have renewed tomorrow. Apple does absolutely nothing to protect iTunes subscribers from ripoffs, so I know I won't get a refund if I pay for another month. Just canceled my subscription. Bugs in updates are one thing. A bug that makes it impossible to access a current issue just illustrates a company's contempt for its customers. Contacted the developers. They said they can't do anything about this. iTunes can't do anything about it either. Seriously? Just glad I canceled before my subscription renewed for another month. Developers smugly say in Help to restore purchases. That only works for past issues. Can't access current issue. How is it even possible to release an update with such a huge bug? My subscription would have renewed tomorrow. Apple does absolutely nothing to protect iTunes subscribers from ripoffs, so I know I won't get a refund if I pay for another month. Just canceled my subscription. Bugs in updates are one thing. A bug that makes it impossible to access a current issue just illustrates a company's contempt for its customers. This app since the update is SO HORRIBLE that I’m thinking of going back to the print version!!! It used to be my favorite magazine app. Now the print is tiny, the pictures are blurry, and there are no more “extras” where you can tap and see additional stuff not available in print. It’s like they let a middle school computer class scan the magazine pages into a PDF and upload it. IT’S AWFUL!!!!!! I would give it ZERO STARS if that was an option. GIVE US THE OLD APP BACK!!!!! I too rarely write reviews but this update is the worst. Very glitchy and blurry. The swiping up feature to read a story just keeps taking me back to the cover. 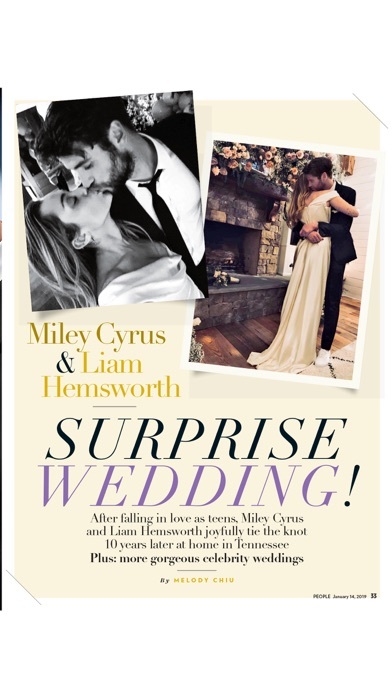 Please, People magazine, fix this app! I loved reading my people magazine...then they changed it..I agree with the other person..the crispness of the magazine is gone. I called and spoke to the digital specialist today, he hemmed and hawed and said everything is the same and didn’t know of any change to the visual look of the digital edition..also used to get my digital copy very early “4am” on Thursday and it is now 3:30pm and I still don’t have the latest copy. Whoever people is using to send the digital version out should be fired and the customer service people should know their job...enough of lying..get your acts together and give people what they are paying for. I don't like the new format at all and am really mad that I have to redownload all the issues I already downloaded. I'm especially frustrated that all my favorites are now gone!! Being the old app back!!! This new update needs a lot of improvement. It keeps crashing in the middle of the issue and never holds my place. It takes longer to open the issue every time and is not user friendly like the old app. Constantly seeing the message to swipe up for reader view is so annoying. I hope they fix these issues soon. What used to be a great app has turned into something I can't even read. The two-page view is too small to read anything without expanding every page. I want my money back. Hate this update. The black bar that says swipe up for reader view is so annoying. Don’t care for the reader view, difficult to read. The overall user experience is trash. Wish there was a way to go back to the previous version. New update stinks. Every time i touch the screen a message saying “swipe up for reader view”appears. The update needs an update! You owe your loyal subscribers better than this reworked piece of junk app. Pictures are blurry. No more close ups. Sad. Ive been a subscriber for several years and I am always wear. Now the “new and improved” app does not know I am a subscriber. I have seen lots of this complaint online but absolutely zero response from People. The reader view is great! I don't think many people seems to know about it but it is now enjoyable and easy to read on my iPad. It was so hard to read before. So glad you updated this! The text is large now and layout of article is perfect. Readers- make sure to swipe up to read otherwise no way could I read just the way it is. Why Do They Always Ruin A Good Thing. I’d love to sit in a design meeting sometime to understand how they decide to make something so much WORSE! This new People Mag app is pretty much worthless. So far, the most annoying “new” app I’ve ever seen — especially when you swipe to a new page and end up a black strip blocking pix/text telling you to NOW swipe up for Reader View. So, instead of one swipe to read the page, you make us swipe twice. The only reason for the second swipe is to get rid of the new and annoying black strip that is not needed! Next they’ll probably impose a full page block with instructions to turn off app and go buy the print issue! Only reason for 1-star is because it won’t let me post with none. I would give this new update zero stars if I could. The text and images are blurry, even when I zoom in on the page. I cannot understand why People (and Entertainment Weekly) thought this new format would work. I was already considering canceling my subscriptions to both magazines. The release of this “upgrade” made my decision easier. I don’t normally review apps, but this new update is a huge step backwards. Some of the most basic functions have been lost. The app no longer keeps track of where you are in the magazine, and you have to open the magazine and find your spot every single time. What’s the use of a digital app and a digital subscription, if it’s this useless. I have been a LOMG TIME subscriber to People. Every Thursday I download the digital issue to read......but now the app is gone or lost. I updated, but nothing happened. Kick the college grad IT out and get a fifth grader to fix it. I don't normally write reviews but in this case I must, if only to warn others not to waste their time and space on this app with the new update. It is absolutely the worst update I've ever seen. What used to be a great app with crystal clear images is now crap. Everything is blurry and so out of focus and small you can barely stand to look at it. So disappointing coming from a company that is supposed to aim for customer satisfaction. I will not be using this app, if a large company such as people magazine can't afford to better their app and instead make it worse, I won't waste my time with it. You better improve this fast or you will lose so many loyal customers. I would put zero stars but of course it doesn't allow that. I’m been reading people magazine weekly including celebrities and royals on digital and prints of magazine but I’m been subscribed of people magazine for years..
Link from list of cover/content is not working anymore. Not active. Now is more time time consuming on searching for article I want to see. Login rarely works, this has been the same problem since the first version. I have been a subscriber to the magazine since the 90’s and am about to cancel. They have ruined the app. Having to re-find my place each time is so dumb and I can find all of these stories in other ways. So disappointed in you People. The previous version of the app was good. Every week I would check for new magazine, download it and read. The latest version stinks. Now each week the new magazine appears in the store with a lock in upper left corner and a message below telling me I can buy for $5.95 I think is the price. Then on Friday I get a message telling me it is ready for download. The benefit of buying a subscription is getting the issue before it hits the newsstands. Unless this ‘bug’ gets fixed soon I won’t be renewing. Wished I had read the past reviews before purchasing this app. OMG... WHAT A DISAPPOINTMENT.... I ordered a specific issue and was given the current issue. Emailed customer service all the order information they can’t assist. Lousy service. What exactly are these new features? When do we get bookmarks????? Great news about the forthcoming update. How near is the near future? Thanks This is a magazine app, not a social media one! I don't have the time to always finish an issue in one sitting. There are no bookmarks! I can't even delete issues offline. Don't piss off longtime readers any further and remember you're providing reading material. Bring on the next update with at least bookmarks!!! This app had bugs before. Now it just super user unfriendly and just plain impossible to use. Frustrating and I guess I’ll just read something else. No stars given for this update. In fact if it was available I would give it negative stars. Have enjoyed the previous app for many years but this one...the worst update! Every time I go back after closing the app to continue reading where I left off it always opens up on the newest issue and then I have to wait for all the issues I have downloaded just to get to the one I had left off at. And then to make matters worse it opens that issue to the first page and like other reviewers have noted I then have to scroll to maybe where I left off. Please fix or go back to the old version. Ps wanted to leave no stars but can’t send review without rating. So one star but not really! The new format is horrible. Downloading the week’s issue is cumbersome, and there doesn’t see to be as many extras as before. Updated 1/26/18 - I’ve been a digital subscriber since day 1. The latest update is so bad and useless that I just CANCELED my subscription! Goodbye People! LATEST UPDATE IS HORRIBLE! Updated 11/24/17 - What happened to the bookmark feature?? Blurry pictures, not user-friendly - especially when reading offline, poor all around! But most of all, if I can't read the whole issue in one sitting, (which is never) I'd like to know where I left off! PLEASE ADD BACK BOOKMARK FEATURE Updated 7/7/17 - What's with the new redesign? The text is too small to read without expanding every page! What happened to all the interactive content? That was the fun part of the digital version. I don't want a shrunken down copy of the print magazine that's too small to read. If that's the case, give me back the crossword puzzle that was in the print version that couldn't be in the digital version! The new version of People magazine is horrible. The pages display SLOWLY and many times partially. It shuts down and bounces you back to the issues list for no reason. The response to finger taps is slow at best. The list goes on and on. I wrote to customer support 12/26 and they gave me canned answers to items I didn't complain about. Clearly they are not concerned. I just deleted the entire app and reloaded. Now I can't even get into the issues. It's stuck in a loop between slowly painting the first page the blanking out and starting over. After months of bad reviews and extremely low ratings I have to wonder why People and/or Time Inc aren't trying to fix this fiasco. Very unhappy with the newest update! All digital aspects have been removed- there is nothing to click on anymore. Seems they took the cheapest and laziest route possible. Now the print is super tiny and their is nothing extra to make the digital version interactive. Every time you reopen the magazine you have to go through the pages and find your page- it doesn't save or bookmark your last read page. Terrible app that gets worse and worse with each new update. Seriously awful and People doesn't care! There is nothing about this app that works....it's exhausting! Bring back the old format. At least you could read the magazine with it. This version is nothing more than an exercise in frustration...IT DOES NOT WORK!! Why did you change it! What happened to the bookmark feature? So frustrating having to search for article every time I open App. Also, the graphics blend into portions of the print that it’s unreadable, no matter how much the print size is increased. Please fix these bugs. Bought 1 magazine and everything was fine so I bought 4 more and they either won’t open or they are not what they say on cover. Worst experience ever. Don’t waste your money. Once again I cannot access latest edition of People, despite being a digital subscriber for years. So far no response from Customer Service, though in past they blame ITunes and tell me to contact them. When I do contact ITunes they tell me no, it’s People magazine’s fault. Unless it’s resolved soon, plan to cancel subscription.